DGCA Jobs 2019 – Are you looking for a state government job? Are you bold and interested to work in the Civil Aviation sector? The DGCA Flight Operations Inspector & Other Recruitment 2019 has announced its vacancy lists. The vacancies are available in the five sectors. The recruitment process is going for filling the vacancy of 11 posts. 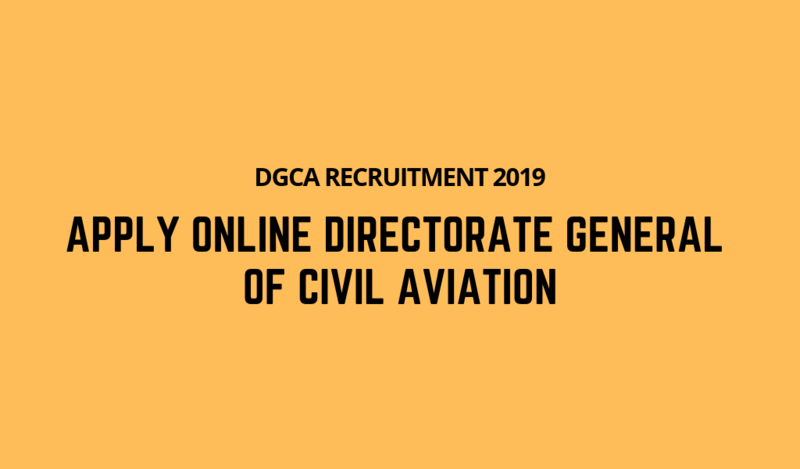 If the candidates want to verify the eligibility criteria, they have to check the official website of the DGCA Various Vacancies Recruitment 2019. The candidates have to submit their application form on or before May 10, 2019. Job Role: Deputy Chief Flight operations inspector (Aeroplane), Senior Flight Operations Inspector (Aeroplane), Flight Operations inspector (Aeroplane), Senior Flight Operations Inspector (Helicopter), Flight Operations Inspector (Helicopter). Deputy Chief Flight operations inspector (Aeroplane) · The candidates should have 10+2 qualifications in Mathematics and physics. ·The eligible candidates should have the Airline Transport Pilot’s license provided by the DGCA. ·Total experience should not less than 6,500 hours and if you are a pilot-in-Command on a transport aircraft, your experience should not less than 5,000 hours. Senior Flight Operations Inspector (Aeroplane) · The candidates should have completed 10+2 with Physics and Mathematics. · They must have an Airline Transport Pilot’s license get from the DGCA. · Your total experience should not less than 6000 hours and if you are worked as a pilot-in-command in air transport aircraft, your experience should not than 4000 hours. Flight Operations inspector (Aeroplane) · The candidates should have completed 10+2 with Physics and Mathematics. · Total experience should not less than 5,000 hours and if you are a pilot-in-Command on a transport aircraft, your experience should not less than 2,000 hours. Senior Flight Operations Inspector (Helicopter) · The candidates should have completed 10+2 with Physics and Mathematics. · The candidates must have a commercial pilot’s license for Helicopter. · Total experience should not less than 3,500 hours and if you are a pilot-in-Command on Helicopter, your experience should not less than 1,750 hours. · The candidates must be certified with an accident-free record at least for 5 years. Flight Operations Inspector (Helicopter) ·The candidates should have completed 10+2 with Physics and Mathematics. ·Total experience should not less than 3,000 hours and if you are a pilot-in-Command on Helicopter, your experience should not less than 1,500 hours. Step 1: If you are interested to apply for the post of DGCA Flight Operations Inspector Recruitment 2019, you have to refer the official website. Step 2: The candidates have to go through the recruitment options and look for the DGCA Recruitment 2019. Step 3: If you are satisfying the eligibility criteria, you have to precede the further process. You have to attach the needed photocopies with your application form.